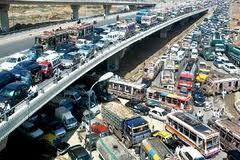 The menace of traffic in Karachi can only be blamed on the people who make up the traffic. From blocking up the roads by parking on the side and leaving only one lane to let the traffic flow, to driving at 30 km/h in the fastest lane at Shahra-e-Faisal, and most importantly, breaking traffic signals and not listening to traffic policemen. So while the problem of traffic jams lies with drivers, traffic police is however have the primary responsibility of keep everything in flow and order. Karachi Traffic Police has now launched an SMS service free of charge with just a one-time subscription fee of Rs 0.5. to stay updated with the conditions of the road by sending “T” as a text message to 8655. The SMS service will then send information regarding traffic flow and advise them about the best alternate route to take in case their traffic jams. But beware folks, DIG Traffic Police Abdul Khaliq Sheikh said that he got the idea of starting SMS traffic updates from the instant messaging services available for paying bills and plans to ‘send a message to all the subscribers after every 10 minutes’, so your phone will be ringing every ten minutes or, you can just call the toll-free number ‘1915’ to get traffic updates.